Coleman Barks who has made resurrect Rumi in the hearts of millions in the west, not only interprets Rumi but also his strange, mystical voice is a joy to hear. Who is best to hear from but the one who made Rumi his exclusive nourishment! Barks, 70, often describes himself as "just one of God's funny family," a sentence used by Bawa Muhaiyaddeeen, Coleman's spiritual teacher who had immense inspiration in bringing Rumi to the English readers. 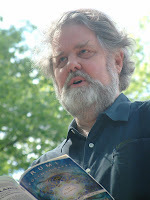 Coleman Barks is a retired Professor of Creative Writing & Poetry in the University of Georgia and has been a student of Sufism since 1977. “If Rumi is the most read poet in America today, Coleman Barks is in good part responsible. His ear for the truly divine madness in Rumi’s poetry is truly remarkable.” - Huston Smith, author, The World’s Religions. Here are a few poems of Rumi translated (or interpreted) by Sufi Coleman and recited by him as well (all are videos via youtube). Clicking each poem will take you to youtube, upon finishing you can come back to this page by clicking BACK on browser button and continue to enjoy the other poems. Let me know which one is your favorite! in the golden candle fire. of strange intermingled joy and sorrow!